Typically on late summer afternoons, Wilson Street in Stratton, Connecticut is quiet and still. It’s lined on both sides by solid two-story homes fronted by plain but well-tended lawns; since it doesn’t run to Main or Center Streets, the only car traffic is local. Most of the men are on the day shift at Queensbury Precision Machine and Tool, and the housewives have finished their shopping and are back home preparing dinner and watching their soap operas. This afternoon, however, hours of relative silence were suddenly broken by the barking of a dog from someone’s backyard. The sound grew louder and sharper as the source of the noise, a big Golden Retriever, bounded eagerly over a side fence and ran up the sidewalk. The dog ran in the direction of two boys who were walking down the sidewalk toward him. One of the boys bent down and spread his arms wide in welcome. The dog let out a yelp of joy and picked up speed. The boy reached down and picked up a stick, then whistled. As the dog approached, he stopped in front of the boys, eagerly waving his tail. The boy waved the stick in time with the dog’s tail. “Go get it, Rex!” The boy threw the stick and the dog took off across the street, making a bounding leap over a hedge. “He never brings it back,” the boy confided to his taller companion with a shrug, and they continued walking. “That’s a much better way to watch a Gemini launch,” he said. Both boys nodded. The two boys ambled inside, past the polished wooden bannister and into the carpeted living room. Three boys and a girl were already inside, seated on the floor in an arc in front of the TV. One of the boys wore a space helmet that was several sizes too large, with the visor pulled down over the front. The screen showed a live shot of a Gemini rocket as it stood poised on its launch pad. A news announcer could be heard in the background intoning facts and figures about the upcoming flight. On the couch, the girl — Dominic’s twin sister — picked up a battered school notebook and a pencil, ready to write down their reports. The boy wearing the wobbly space helmet flipped his visor up. “Five cans,” he said, his voice muffled by the cavernous helmet. Then he quickly snapped the visor back down. “I found some old spark plugs that we can use for fuel igniters,” added Throttle. Everyone cheered and clapped. Rod stood up and bowed with a fourish. Rod whistled, and everyone clapped again. “Congratulations, Debbie. That’s a full month’s quota at your very first meeting! You’re the first member of the Tin Can Society to accomplish that feat.” Debbie beamed. “Right,” Dominic continued. “You know the rules. Give your cans to Throttle, and give your lids to Debbie. And make sure you write your names on the lids so we can keep track of everybody’s counts. And remember: the lids are our treasury. We must guard them with our lives and our sacred honor.” Dominic crossed his heart with great solemnity, and everyone else followed suit. “The Tin Can Society forever!” they shouted in unison. 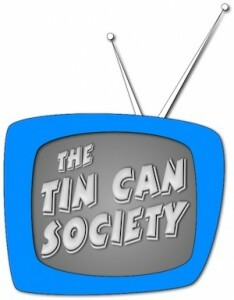 “I hereby adjourn this meeting of the Tin Can Society!” said Dominic as he sat down in front of the TV to watch. The final countdown was just beginning, and at zero a cloud of white smoke emerged from the base of the silver pencil-like rocket. As the Gemini spacecraft took off, it climbed a trail of flame as the Tin Can Society cheered its progress. As the rocket climbed higher and quickly shrank to a dot arcing out over the Atlantic, Throttle leaned over to Rod and said with conviction, “Pretty soon that’s going to be us, you know.” Rod nodded with excitement, his eyes glued to the TV screen. After the Gemini launch, the members of the Tin Can Society clambered down the back porch steps of the Belanger house and trooped across their neighbors’ backyards to Stonegood Park, where they would work off their excitement pretending the swings were space capsules and the slides were splashdowns. Stonegood Park’s baseball diamond is also where they launched their ever-bigger model rockets. They called these outings their training sessions, because they were part of the Tin Can Society’s grand plans to eventually build a full-scale rocket that would carry them into orbit just like the astronauts. They had just organized an expedition to explore the thicket of trees at the park’s far end (to learn survival techniques should they ever be stranded on a hostile alien world) when they heard the sound of heavy trucks driving down Chestnut Street alongside the park. Then they heard squealing brakes and men shouting. They stopped their mission to see if they could spot anything through the trees. “Come on!” said Dominic. The six members of the TIn Can Society ran to a crop of boulders and crouched behind them together. Throttle snapped his helmet’s visor down and squeezed his eyes shut. Phillip pointed. “They’re from NASA! What’s NASA doing here?” he whispered. Suddenly, they saw several men in green Army uniforms and carrying sinister black rifles trudging through the woods in their general direction. They were followed by two men in business suits, who seemed unfazed by the hubbub. The members of the Tin Can Society looked at one another in surprise and puzzlement. The members of the Tin Can Society warily stood up. “What’s happening?” Dominic asked the sergeant. The six friends looked at each other in surprise, excitement suddenly replacing their fear. Outer space? Together, the Tin Can Society scrambled to follow the sergeant into the woods. What will the Tin Can Society find deep in the woods of Stonegood Park? Find out when their first adventure continues! This entry was posted in The Tin Can Society. Bookmark the permalink.